Since 2008, members of Congress have mentioned the Fortune 100 companies over 84,000 times. Using Quorum Federal, we identified key trends on the top sectors and companies mentioned by lawmakers over the past decade. Learn which Fortune 100 companies generated the most buzz from Congress in our full 30-page report. Read more about our methodology below. 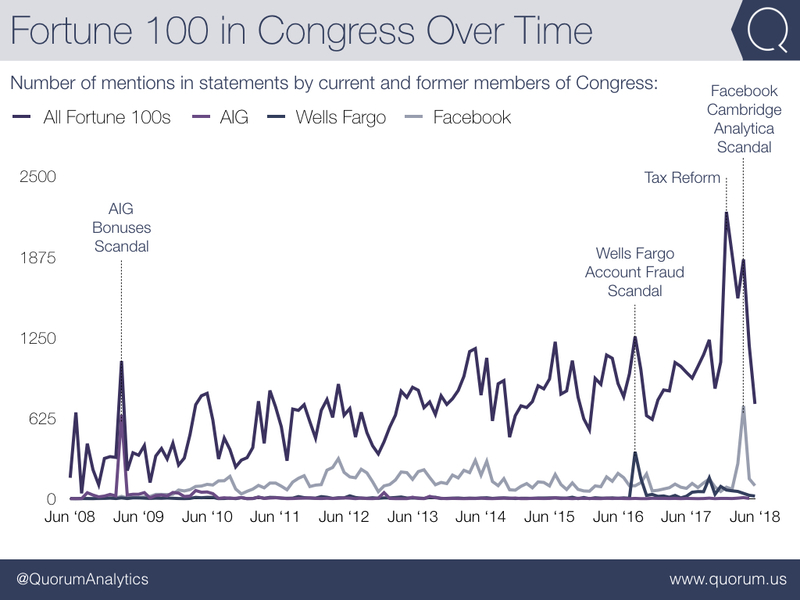 AIG, Wells Fargo, and Facebook own the most notable months of dialogue from Congress since 2008. Combined, dialogue on Fortune 100 companies has steadily increased over the past decade. The passage of tax reform in December 2017 marked the largest spike in collective Fortune 100 dialogue from members of Congress. Facebook CEO Mark Zuckerberg's testimony before Congress in April 2018 was the most notable month of dialogue from legislators on a single company. Facebook's spike is preceded by mentions of AIG in March 2009 in the fallout of the financial crash and mentions of Wells Fargo in September 2016 following the account fraud scandal. Companies in the technology sector have dominated the decade of dialogue from Congress. The video below highlights this trend. The location of each circle on the map represents the headquarters location of a Fortune 100 company, while the color of the circle corresponds to the sector and the size of the circle shows how much members of Congress mentioned that company in the given month. Watch to see it unfold in the video below, and click here to interact with the dataset yourself. 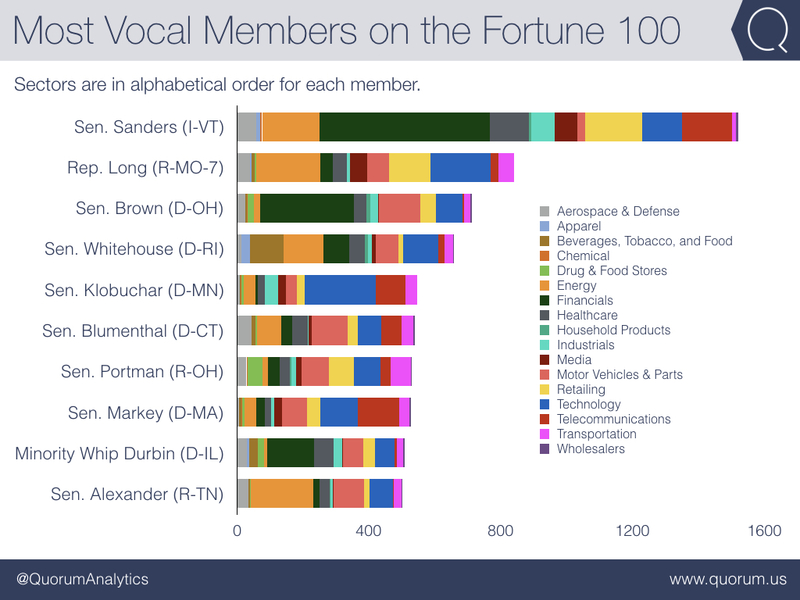 Sen. Bernie Sanders (I-VT) leads Congress as the most vocal member on Fortune 100 companies. Sen. Sanders has mentioned Fortune 100 companies 1,542 times over the past decade—nearly double the second the most vocal member, Rep. Billy Long (R-MO-7), at 840 mentions. Rep. Long is the only House member in the top ten in large part due to his very active Twitter account (53 tweets a day including retweets). Methodology: The data featured in this report looked at the top 100 companies on the 2018 Fortune 500 list. This report analyzes congressional mentions by current and former members of each of the companies between June 19, 2008 and June 19, 2018. Using Quorum Federal, we found approximately 84,000 results from press releases, floor statements, email newsletters to constituents (2016-present), and social media posts. For each instance, we pulled out the company being mentioned, the date, the member of Congress, and the member’s political party. Sector and headquarter location for each company were drawn from Fortune, Inc.